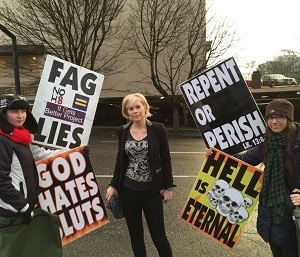 The Westboro Baptist Church has protested a Christian conference, over the performance of openly gay singer Vicky Beeching. Christian rock singer Vicky Beeching came out as gay publicly in August, and speaking to PinkNews said she hoped her coming out would help others to do the same. However, her keynote speech at the Gay Christian Network conference became a target for the notoriously homophobic Westboro Baptist Church, from Topeka, Kansas. The singer was not deterred by the group when appearing at the Portland event yesterday – even stopping to pose for a picture with them. She said: Arrived just now at #GCNConf to a loud crowd of Westboro Baptist protesters..and to a giant rainbow above them. The group also faced a counter-protest from pro-gay Christians, who outnumbered them massively. The counter-protesters formed a ‘wall of love’ to prevent the anti-gay group from reaching conference goers.